The ERSO 1030 FB – High Speed Heavy Duty Full Bleed (Gutter-Cut) Professional Automatic Electric Business Card Slitter. 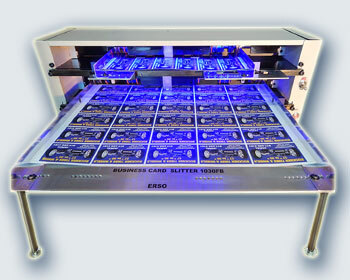 This new slitter is designed to cut down full color business cards with full bleeds from four different stocks. - 30 business cards per sheet from 13" x 19" card stock. The finished product is created in 2 quick steps (passes) and a short time to reset guides. First pass cuts a sheet into 3.5" strips with a 0.125" (1/8") gutter between the strips, and then second pass cross cuts these strips down to finished 2" x 3.5" cards with a 0.125" (1/8") gutter between the cards. The infeed stack allows keeping up to 70 pages #150 /350 g/m2/ and cutting at a speed of up to 550 business cards per minute.